There was an alarming drop-off in the level of available seasonal labour last month in the UK, new figures show. Data from the NFU’s monthly labour survey showed that the shortfall of seasonal workers on farms in England and Wales hit 29.3 per cent in September, compared to 12.8 per cent in August and 16.4 per cent in May. The problems caused by the devaluation of sterling and general unease around Brexit have been compounded by seasonal workers hitting the tax threshold earlier in the summer, leaving growers short later on in the season. Outlining the severity of the problem at the National Fruit Show in Detling, NFU horticulture board chair Ali Capper stressed that with returnee numbers also showing a worrying decline, the government essentially needed to make a decision before the end of this year on implementing a new scheme. 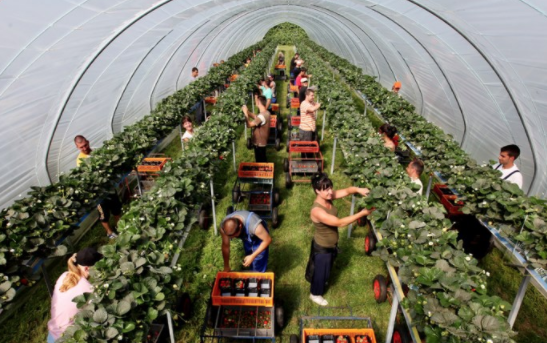 Capper called on government to put in place a scheme that would allow the industry to source non-EU migrant labour, echoing the support growers in other EU nations get from their own governments. For example German farms are able to source labour from the likes of Ukraine and Germany, Portugal gets staff from Thailand and Spain has access to a labour pool from Morocco. “We are out on a limb here in the UK and at a competitive disadvantage,” Capper said. “A [non-EU labour] scheme would trial the mechanisms and let government see what will work.” She added that she did not mind what countries the labour comes from, as long as access is there.